DIY sunscreen is a simple, natural, and effective way to stay safe in the sun. This homemade sunscreen just takes a few ingredients to whip up and includes an option to help keep bugs away. Follow my tips below on how to make sunscreen that is ultra moisterizing. To make this recipe, you will need: shea butter, beeswax, coconut oil, non -nano zinc oxide, vitamin e (optional), and essential oils (optional). I’m so excited about this recipe! 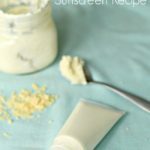 My homemade natural sunscreen recipe is thick, creamy, and super moisturizing! Plus, it has a bug repellant option so you can keep mosquitos at bay while your working in the garden. It’s filled with simple, nourishing ingredients so you don’t have to worry about what kind of crazy cancer causing chemicals you are putting on yourself or your child. Lately I’ve been thinking a lot more about my skin health, sun protection, and healthy aging (not because I’m getting some wrinkles on my forehead from my overly expressive face or anything… cough cough). Does anyone else find it ironic that even though we are slathering on more sunscreen than ever before that skin cancer is more prevalent? The truth is sunscreen blocks UV rays which can lead to a vitamin D deficiency. Vitamin D has been shown to reduce the risk of many cancers. So we don’t want to completely shy away from the sun. We need about 10 minutes of sun exposure everyday to get the vitamin D we need (source). Mosquito Repellant Sunscreen: To make a sunscreen that repels mosquitos add in citronella, or other repellants like cedarwood, lavender , or peppermint. This works amazing. Before I would go out in the garden for 2 seconds and be eaten alive, but not anymore when I use this bug repellant sunscreen. You can also get a synergy blend like Shield Me. Cooling Sunscreen: Add peppermint essential oils to give the sunscreen a cooling effect. It’s kind of like a built in air conditioner! Placing in an old deodorant tube makes the sunscreen a roll on. Keep stored in a cool place like the refrigerator to avoid melting. This sunscreen has an SPF around 20. This sunscreen stays on well and is long lasting. It is water resistant, but not waterproof so apply frequently when in water. If you would like thinner sunscreen substitute a tbs or two of shea butter for a liquid oil like almond or jojoba. 2 Tbs non-nano zinc oxide powder – Did you know that Zinc Oxide have antibacterial and anti UV properties? This is why sunscreen includes this ingredient. It prevents the sun from damaging your skin, which is why wearing protection in the sun is vital. A topic like this is quite interesting. 10-20 drops essential oils (for bug repellant option use citronella, cedarwood, lavender , peppermint etc.) Don’t use photo sensitive essential oils like grapefruit, lemon, orange, etc. Place first coconut oil, shea butter, and beeswax into a double boiler or mason jar and lightly twist lid. Place jar into a pot with a few inches of simmering water and let ingredients melt stirring occasionally. Once melted, take mason jar out of the water, and mix in zinc oxide and vitamin E (be careful NOT TO INHALE ZINC OXIDE). Allow to cool for a few minutes and stir in essential oils. Pour sunscreen into a squeeze bottle like this one, an old deodorant tube, or a mason jar. Keep stored in a cook dry place! Want more homemade skincare recipes? Check these out! Homemade Makeup Remover – is my favorite “recipe” and so ridiculously easy. My favorite shea butter and aloe face cream. DIY sunscreen is a simple, natural, and effective way to stay safe in the sun. 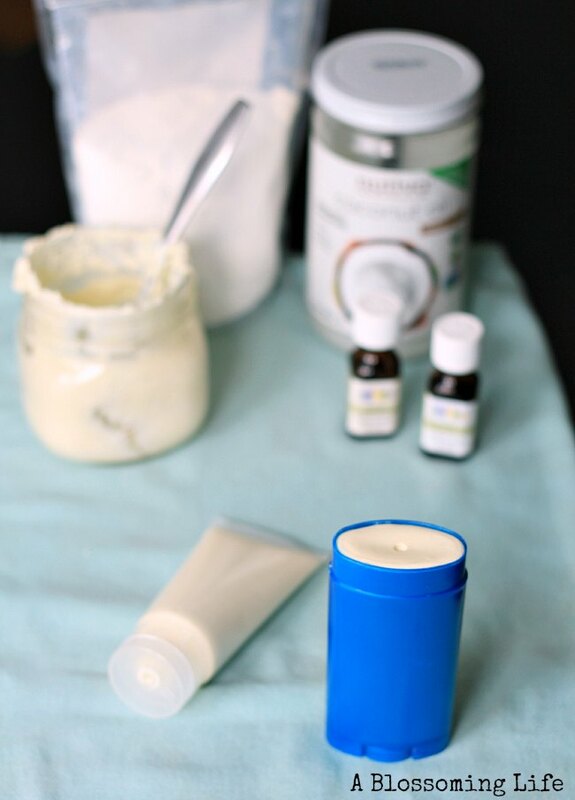 Homemade sunscreen takes a few ingredients and has a bug repellent option. Place first 3 ingredients into a double boiler or mason jar and lightly twist lid. Place jar into a pot with a few inches of simmering water and let ingredients melt stirring occasionally. Once melted, take mason jar out of the water, and mix in Zinc oxide and vitamin E (be careful NOT TO INHALE ZINC OXIDE). Allow to cool for a few minutes and stir in essential oils. Pour sunscreen into a squeeze bottle like this one, an old deodorant tube, or a mason jar. Keep stored in a cook dry place! Always talk to your doctor before using essential oils. They are differing opinions on the safety about using essential oils during pregnancy. Children and pregnant women should avoid using many essential oils. Always check with a medical provider. 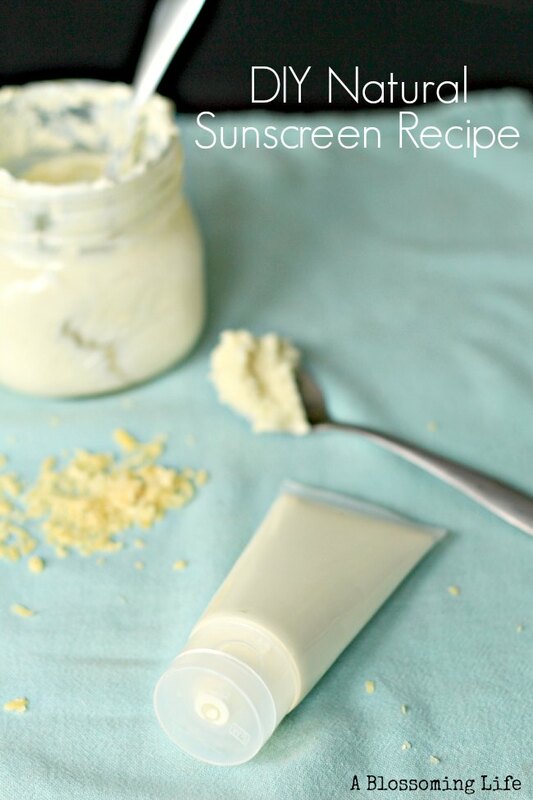 Are you excited about making your own sunscreen? Have you tried making it before? Where can I buy zinc oxide? You can click on the link in the recipe. You want to make sure its non nano zinc oxide! Thanks so much for this – I have vitiligo and have about 80% pigment loss so have to wear sunscreen everyday and am currently totally freaking out about the stuff I am ingesting with it and experimenting with making my own. This would be perfect for milder days when the sun isn’t too strong. Do you happen to know if the essential oils you posted are safe to use on a baby/ younger children? I have a 6 month old boy and a 7 year old boy. I know I have heard lavender is a no go on boys because it has estrogen mimicking properties (or something to that effect). Curious about the others, cause we live in buggy, sunny florida. Thank you! I love your dress in the picture on your homepage! Is the recipe as posted more of a lotion or a stick? I’m confused as it is pictured it a roll up tube and a squeezed lotion dispenser. So glad to find this, Amy! I’ll be making some! I’m becoming more and more aware what goes on and into our bodies!! Would love for you to share this at our link party on my blog please! 🙂 Look forward to making it! Doesn’t citrus make your skin more sensitive to the sun ? If I need a protection of 70% should i used 7 tbs of zinc oxide powder? I am not sure Silvia. I believe anything over an 50 SPF doesn’t really give you better protection. So you could probably add a little more zinc oxide but 7 seems like too much. Where did you find the squeezable tube? I have been looking all over the internet for them. What can I substitute the bee wax with? I love the idea of adding peppermint to the sunscreen to make a cooling sensation. My 2 and a half year old would like that. I have bought natural sunscreen before but it is very expensive. Looking forward to trying this recipe. Natural sunscreen is pretty expensive and I feel like the tubes are so small! Hopefully this will be much more cost effective for you. Also, I believe peppermint extract should be avoided for kids under six due to a possible breathing issues it can cause. And I got your email and I’m going to try to PM you after dinner! Yes I have heard that about peppermint but I diffuse it in my house. However you are probably right. Maybe I will do he citronelle for bugs instead 🙂 I’m glad you got my email. Look forward to hearing from you. It has been a while since you wrote this article. Have you found anything new to add to or change the recipe? I’ve read that adding vanilla can improve the performance of a DIY bug spray, ans since I’ve got it on hand, I’ll throw it in too. I am curious. You talk about a deodorant stick or a squeeze tube as good receptacles. Which is better for the recipe you posted? I was thinking of just using some old jars. Thanks!